I arrived home this evening to find a package waiting for me. It was my prize for winning the MeatHenge Meat Platter Contest: The Epicure’s Lament by Kate Christensen. 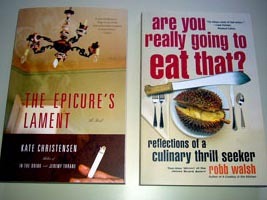 As an extra bonus, the nice people at Anchor Books also included an extra title: Are you really going to eat that? by Robb Walsh. Glad to hear you like the Walsh book, I actually opened it up and read a few random paragraphs and it looks good. I have so much on my reading list right now, but I’ll definitely do a post when I read these books.